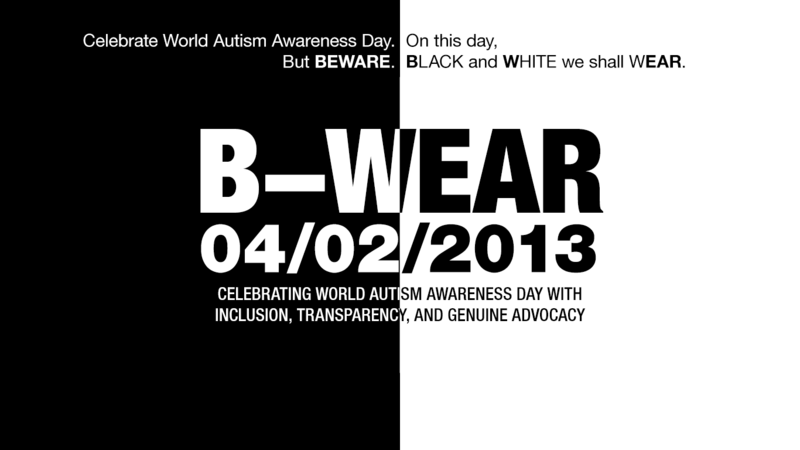 As World Autism Awareness Day is fast approaching, so is B-WEAR. What’s the deal, really? Basically, the objective of B-WEAR is a remonstration against Autism Speaks’s bigoted propaganda, embodied in its hypocritical advertising campaign (under the ruse of “awareness”) called “Light It Up Blue.” It encourages everybody to celebrate the UN-mandated World Autism Awareness Day in spirit of inclusion, transparency, and genuine advocacy, qualities that Autism Speaks has never exhibited (and will never do so). How can you be part of this celebration? Here is the main way to join this campaign: Wear anything plain black or plain white. Be it an upper garment or a lower one, as long as it is primarily the colors mentioned. Avoid using blue as much as possible. Blue is the color of Autism Speaks, and we wanted to show them that we don’t support their nonsense. For blog owners, switch your color themes in a way they use only black, white, or grayscale. On 2 April 2013, change your profile pictures in your social networks to either plain black, plain white, or a black-and-white photo. Keep your lights on from 5:30-7:00 PM, or switch them off altogether. By no means use any blue-colored lights. Speak up against the hypocrisy, the bigotry, and the paranoia of Autism Speaks in your blogs, social networks, or even in your daily interactions. There are a lot of ways you can celebrate WAAD with B-WEAR. Just don’t forget this: Black and white is a yay. Blue is a nay. Participating in B-WEAR is compatible with counter-events organized by autistic self-advocates, like Shut It Up Grey, Tone It Down Taupe, and Autism Acceptance Day/Month, among others. As I have already mentioned in my previous post, you don’t really need to do anything else extra, nor do you need to shell out money to participate. And any autism and disability advocate, self-advocate, or common Joe can be part. All you need is a heart for transparency, inclusion, and genuine advocacy. Hi. I can’t seem to change my theme color scheme. Are any other ways I can do to B-WEAR? Yes! Thank you for supporting B-WEAR and genuine advocacy! You can switch your profile pics on your social networks (FB, TW, Gravatar, WordPress, etc) to either plain black, plain white, or a grayscale image. In real life, you can either opt to continue using your usual lights or switching them off. There are plenty of possibilities you can choose or devise yourself.